There’s an influx of Warhammer licensed games on the market at the moment with mixed reviews. As an ex 40K player I thought it was about time to have a look so grabbed a copy of Doomseeker from Ninja Division. Place the game board in the centre of the table. Each player then chooses a Slayer to play for the game, either randomly or choosing which they want. Each Slayer card shows their character ability, their strength, shown in a red circle and their health, shown in the red blood drop. Slayers are kept face up in front of players throughout the game. Shuffle the grudge deck and deal each player one grudge card. These will earn your slayer extra renown at the end of the game and are kept face down and secret. Shuffle the fate deck and deal five to each player. Then give everyone two one gold tokens, one six-sided dice, and a player reference card. Build the Doom Deck dependant on the number of players. 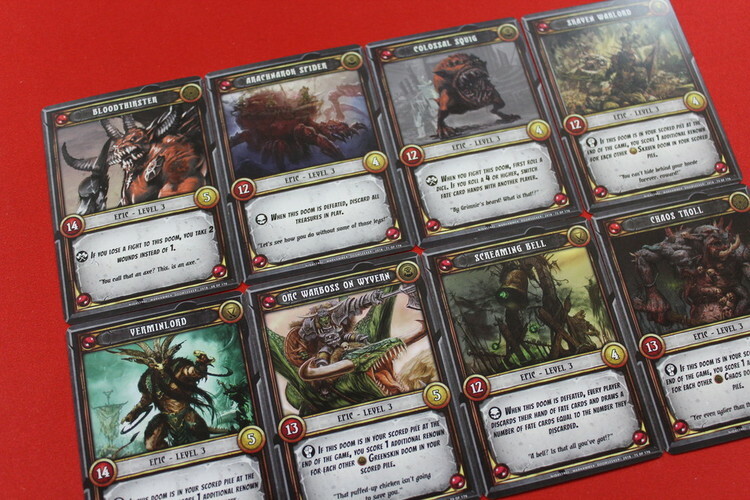 Level three Dooms on the bottom (2,3 or 5 if 2,3 or 4 players), then level two (4,6 or 10) and finally, level ones (11,16 or 18) Place the Doom deck on the space indicated on the board and lay the top five cards onto the five battlefield spaces on the board. 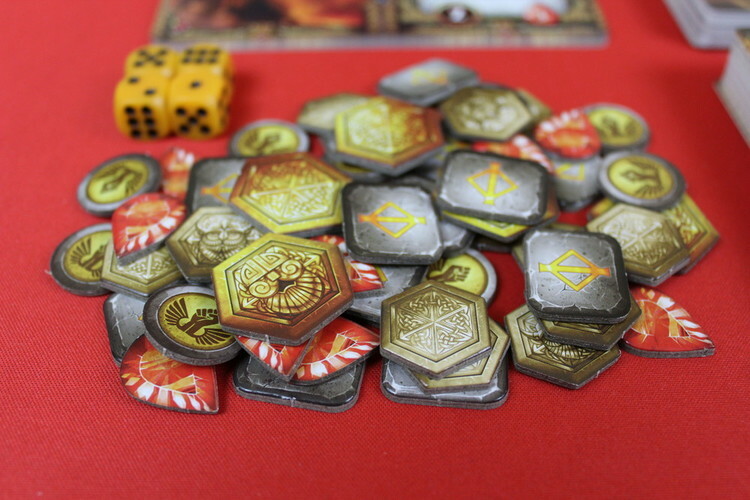 Shuffle the treasure deck and lay out the top five cards onto the spaces on the board, place the deck where indicated. Note the sixth battlefield and shop space are only used when indicated by in-game effects. 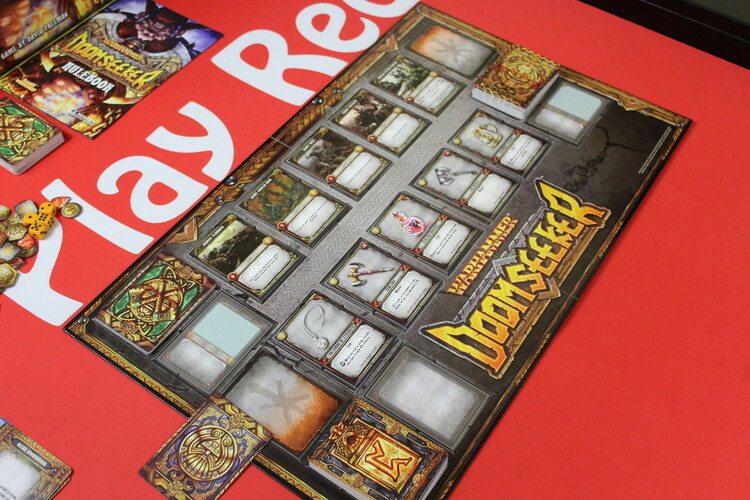 Players decide who will go first and that player is given the Saga card, this will track game rounds and also details special rules that affect the card holder. Each player now has the chance to play a fate card. These will influence what happens on the battlefield. 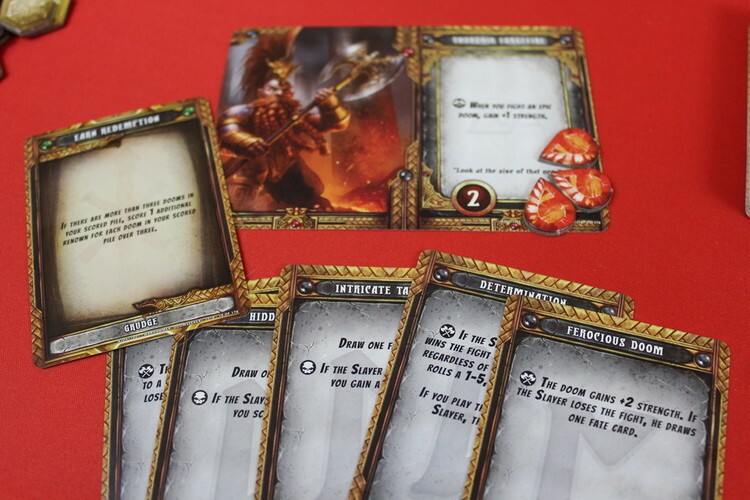 Starting with the player to the left of the active player and proceeding clockwise, each player has a chance to play a Doom card from their hand to change the fight that is about to happen, finishing off with the active player. When you fight a Doom, roll your six sided dice. Add the roll to the Slayers strength, not forgetting to add or subtract any modifiers from equipment or fate cards. If the total is equal or higher than the strength of the Doom, you have defeated it in battle! Place the defeated Doom face down in a pile next to your Slayer card and gain gold equal to the gold value listed on the Doom. If your total was lower than the strength of the Doom, you lose the fight and take a wound token. Discard the Doom card from the Battlefield. If you roll a one you are automatically defeated regardless of any Fate cards or equipment in play. Buy any number of cards from the shop that you can afford. If you have more than five Fate cards in your hand, you must discard down. Once a turn is completed, play proceeds to the next player. The round ends when each player has had a turn and you are back to the player who holds the Saga card. This is then handed to the player on the left and a new round begins. If a Slayer gains a number of wound tokens equal to the wounds shown on their card, then they are dead! However, the game doesn’t have to be over! If a Slayer is killed by a Doom, they add that Doom card to their score pile rather than discarding it, though you do not receive the gold reward. Turn your Slayer card face down though all of your other cards and tokens remain in play. During other players turns you may still play fate cards to influence battles. You do not draw extra Fate cards as part of your turn, though if you play a card that allows you to draw cards you may do so. You may also bet on the outcome of battles. Instead of playing a fate card, you may discard a rune token or a Fate card to bet on the outcome. You will wager that the Slayer will either win or lose the battle. If you are correct, you gain a renown token. When no Dooms remain in the deck, play proceeds until it reaches the player with the saga card or if there are no Dooms left to fight. All players total their renown, even the dead ones! 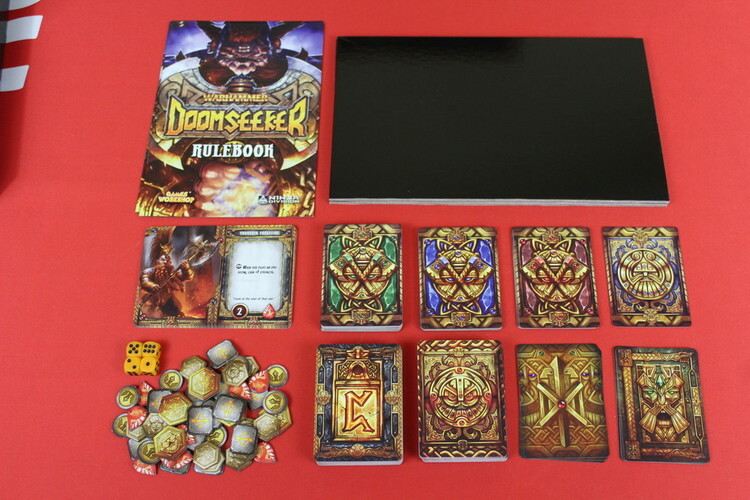 The player with the most wins, in the case of a tie the player with the most Doom cards in their scored pile wins. While the art and style of this game is very true to the Warhammer universe, the game itself felt like a step backwards. Gamers who are used to this universe are at home with complex rule sets and intricate details. Sadly, this game felt very simple, with very little differential between any of the Slayers or the Dooms. It may be this is trying to appeal to people who are unfamiliar with the IP, but then there are dozens of similar games. If you are trying to draw tabletop gamers into a board game hobby, I feel like you need to offer them a bit more. However, this is a game that could be easily expanded to add new depths and strategy that is currently lacking and I hope to see an expansion in the near future.